It’s a 29°C evening as I type this blog post and my train of thought has somewhat become incoherent but seemingly it’s way too hot to fall asleep just yet. Blogging has really taught me how to think on my feet and be more creative with my clothes as after a couple of months go by, you realise just how expensive this hobby can get albeit my favourite escape. The key to keeping things fresh without breaking the bank is to be versatile. Learning to be versatile could very well be the difference between you running out of steam and money or keeping consistant with your beloved style. The following look shows just how versatile you can be with your button down shirt. 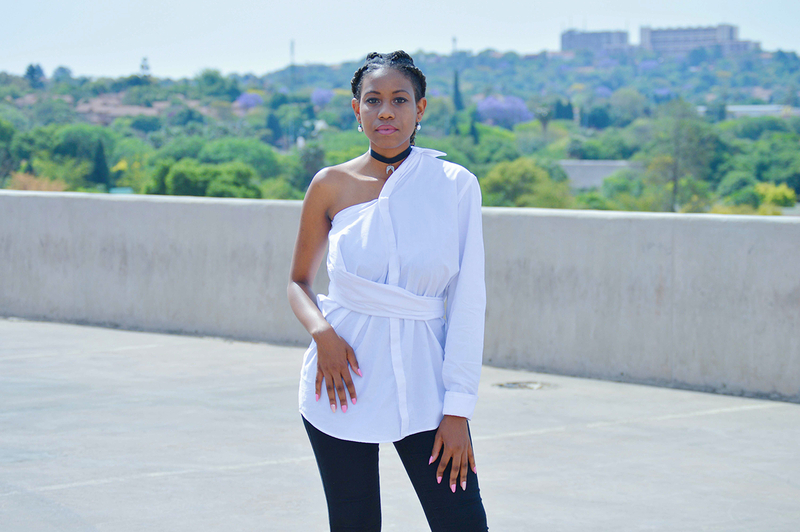 For a quick run down on how I achieved this look, you button up the shirt as far up as possible with one arm left out, then you take the sleeve and wrap it towards the front around to your back and tuck into your high waist jeans. Pretty straightforward! With this next look I show you how to layer and I layered my denim shirt with a black camisole top. You can also wear this tucked in but I decided otherwise. This is a major trend right now and you can do it with t-shirts as well. I’m a choker junkie and this one is from one of my favourite SA designers, Matte Nolim. It’s time to go and get a little creative! I love this! especially the white shirt but I don’t think I can pull it off!! You definitely can, I can help you ? ?